This article details how experts have expressed concerns pertaining to radiofrequency (RF) emissions from “baby monitors” and then how Commonwealth Edison Company attempts to minimize concerns over smart meters because they are just like baby monitors. Keeping in mind the cautionary statements regarding baby monitors and other wireless devices as expressed above, please view the following video clip which contains an excerpt from an informational film produced by Commonwealth Edison (ComEd), supplemented with commentary by SkyVision Solutions. Who and what do you trust? … Would you trust the utility or would you trust the expert sources listed in the first section of this blog posting? The ComEd video is thoughtless and irresponsible propaganda. Baby monitors are 100% voluntary purchases; smart meters are being imposed against the will of the people. The use of a baby monitor is likely to be intermittent; exposure to a smart meter is chronic and could be for the rest of your life. The placement of a baby monitor can be easily changed; the location of a smart meter is generally fixed or is extremely expensive to move. “War-Gaming Cell Phone Science Protects Neither Brains Nor Private Parts,” Huffpost Healthy Living, by Dr. Devra Davis, May 21, 2013. Dr. Devra Lee Davis, M.P.H., Ph.D, is recognized internationally for her work on environmental health and disease prevention. A Presidential appointee that received bi-partisan Senate confirmation, Dr. Davis was the Founding Director of the world’s first Center for Environmental Oncology and currently serves as President of Environmental Health Trust, a nonprofit devoted to researching and controlling avoidable environmental health threats. Dr. Davis holds a B.S. in physiological psychology and an M.A. in sociology from the University of Pittsburgh, 1967. She completed a Ph.D. in science studies at the University of Chicago as a Danforth Foundation Graduate Fellow, 1972 and a M.P.H. in epidemiology at the Johns Hopkins University as a Senior National Cancer Institute Post-Doctoral Fellow, 1982. She has also authored more than 190 publications in books and journals ranging from the Lancet and Journal of the American Medical Association to Scientific American and the New York Times and elsewhere. “A Possible Association between Fetal/Neonatal Exposure to Radiofrequency Electromagnetic Radiation and the Increased Incidence of Autism Spectrum Disorders (ASD),” by Robert C. Kane, Medical Hypotheses (2004) 62, pages 195–197. “The Potential Dangers of Electromagnetic Fields and Their Effect on the Environment,” Parliamentary Assembly Council of Europe (PACE), Resolution 1815, May 27, 2011. “Autism and EMF? Plausibility of a Pathophysiological Link Part II,” by Martha R. Herbert and Cindy Sage, Pathophysiology, June 2013 (Vol. 20, Issue 3, Pages 211-234). The BioInitiative Report 2012, Section 19, “Fetal and Neonatal Effects of EMF,” page 2. The BioInitiative Report 2012, Section 1, “Summary for the Public,” page 22. For information on published studies showing biological effects from RF exposure, one can review summary information charts contained within The BioInitiative Report 2012. To interpret information in the charts, note that the 910 microwatts/m2 mentioned in the ComEd video is equivalent to about 0.1 microwatts/cm2. Understanding the difference in units, refer to the BioInitiative Report Color Charts for Reported Biological Effects. Opinion Editorial: “ComEd Experiment Too Expensive for Consumers,” Chicago Tribune, June 21, 2011. The full editorial by Lisa Madigan, Illinois Attorney General, is available at the following link: https://web.archive.org/web/20130328040326/https://www.lisamadigan.org/Newsroom/lisainthenews/item/2011-06-lisa-madigan-opinion-editorial-comed-experiment-too. This entry was posted in Smart Grid, Smart Meters, and RF Emissions and tagged Baby Monitors, ComEd, Health Effects, RF Emissions, Smart Meters. Bookmark the permalink. 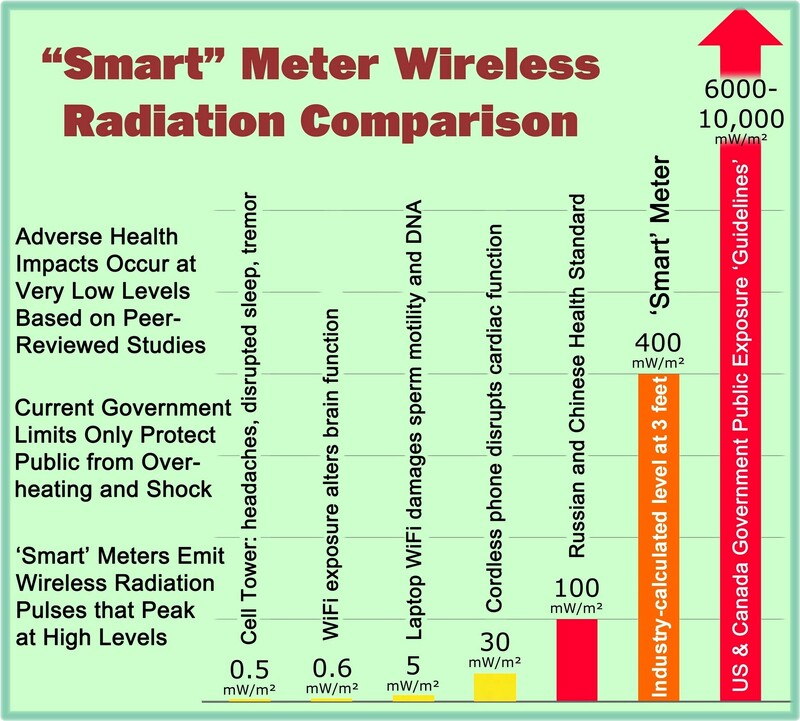 It is an absolute disgrace the way this Microwave Industry keeps on pushing these Electric and so-called Smart Meters…….read here ” Not so smart meters” onto their customers as well as Microwave Phones. All of these devices are now showing to be Type 2B Carcinogen Causing Machines. Even baby monitors emit powerful Microwave Frequencies which are harmful to babies and to fully grown adults if those children and or adults are within the range of these Microwave machines. It is the Evil Lust for Money or Mammon at any price, which is driving this hair-brained and now proving to be criminal industry. Where is their Duty of Care for Human Health. It is truly non-existent, thus making this Industry a Scourge all over the EARTH. These purveyors of this modern and sickness making industry deserve to be dragged into Court kicking and screaming if necessary to face a responsible Judge and a Jury of twelve Jurors straight and true for the evils they keep on heaping on the heads of innocent people. After a fair trial those proven to be guilty of these crimes of mass Microwave Poisoning need to be flung into gaol for up to fifty years to be served in full with no remission for good behaviour.